Signal transmission in electronic applications and data communications is changing in a dramatic way. Cables now have to accommodate faster signal speeds over longer distances with less signal loss. 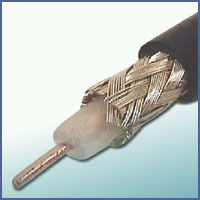 Additionally, new shielding requirements to meet FCC RFI/EMI emission controls, tougher fire regulations requiring low toxicity materials in plenum installations and demands for high density wiring are factors which have been considered in creating many of our new coaxial and data cable products. The products in this section are designed to meet these needs for safe and reliable transmission of voice, video and data.